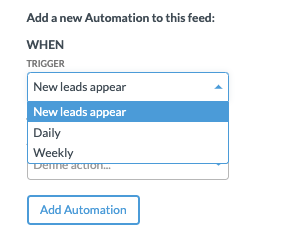 When you create a custom feed, you can set up an automation for it: define which Trigger should kick off an Automation and which Action should be automated. For example, you can define that new leads will automatically be assigned to a selected user. This trigger will be activated as soon as the account is updated with new data from Google Analytics (accounts with Leadfeeder Booster are updated 12 times a day). Every lead that visited the website between the previous and latest update will be processed by the workflow. You can schedule when an action will get executed. If Daily Updates are requested, all new leads visiting from 9AM to 9AM the following will be processed in the user's local timezone. If Weekly Updates are requested, all new leads that visited, for example, last Monday at 9AM to the following, current Monday at 9AM, will be processed in the user's local timezone. In order to avoid duplicate actions, every lead that matches your Custom Feed's criteria after automation is launched, will be processed only once. This action will add a chosen tag to the eligible lead. Read more about tags here. Eligible leads will get assigned to a Leadfeeder user of choice. Sends lead details to a specified email address. You can define an additional short message that will get added to the beginning of every email. NOTE: To perform the action above, this Email to button you see below the lead logo while in the lead details suffices. If you wish to continuously notify yourself or others about a visiting lead and their behaviour, use the standard Email notification settings. Leadfeeder will send a Slack message to your selected channel with up to 20 leads sorted by latest visit date. Please note, this action requires your website to have Slack integrated with Leadfeeder. 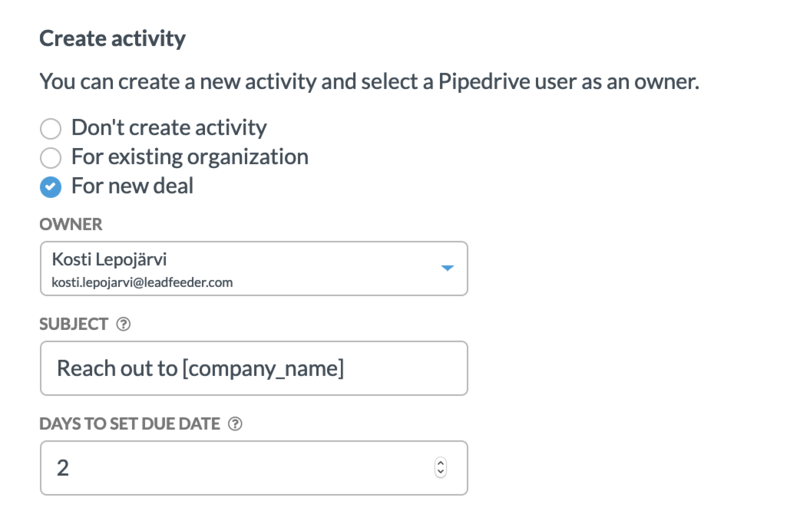 In the first stage you define if you want the automation to create a new organisation for the given Leadfeeder lead that matches to your custom feed criteria. If unselected, the automation will only take into account the leads already connected to an organization within your CRM when creating new deal or an activity. In the next phase, you'll decide if you want to create a new deal for the organisation that Leadfeeder lead is connected to (or just newly created, if you chose to have the toggle on in the previous step). If unselected, we will take only existing deals into account when creating the activity. In the final phase you choose whether you want to create activity. Please notice that the choices in this section are dependant on your earlier selection of creating a new organisation and a deal or alternatively choosing to only take into account existing organisation and deals. In the example below the user didn't choose to create a new organisation but wanted the automation to create a new deal. Can't see this feature in your Leadfeeder account? 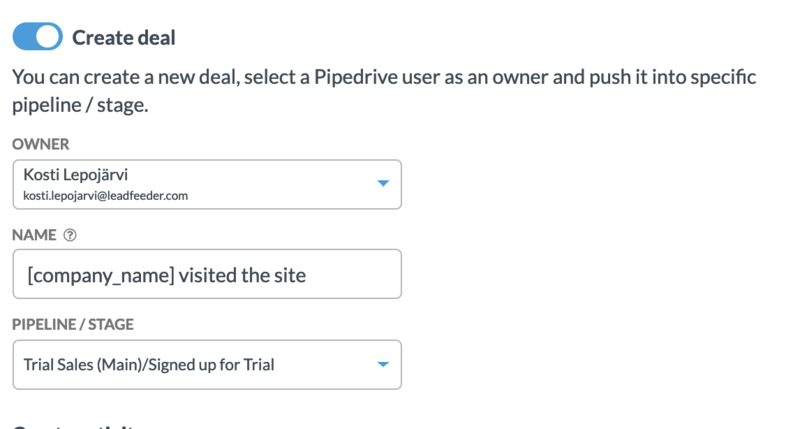 This is primarily available for Pipedrive users, but other CRMs we integrate with will follow soon. If you are interested in to give it a try, please email us at support@leadfeeder.com. With the automation, an account/company can be created automatically to your CRM. 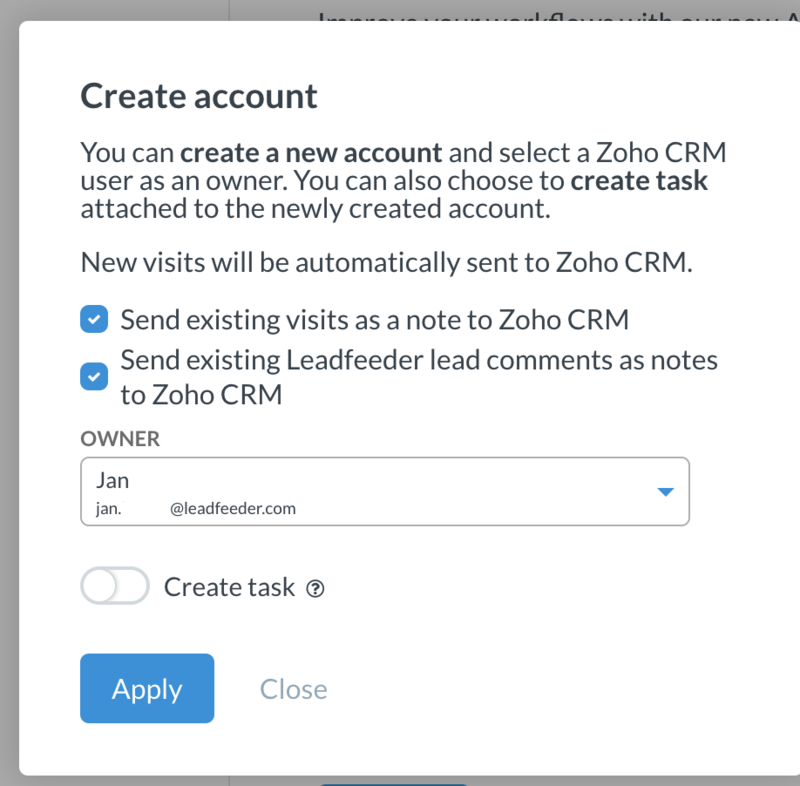 Choose if you want to send existing visits and Leadfeeder lead comments as notes. Pick up the owner from the menu, and also if you want a task to be created as well. If you turn on Create task, the following view will open. 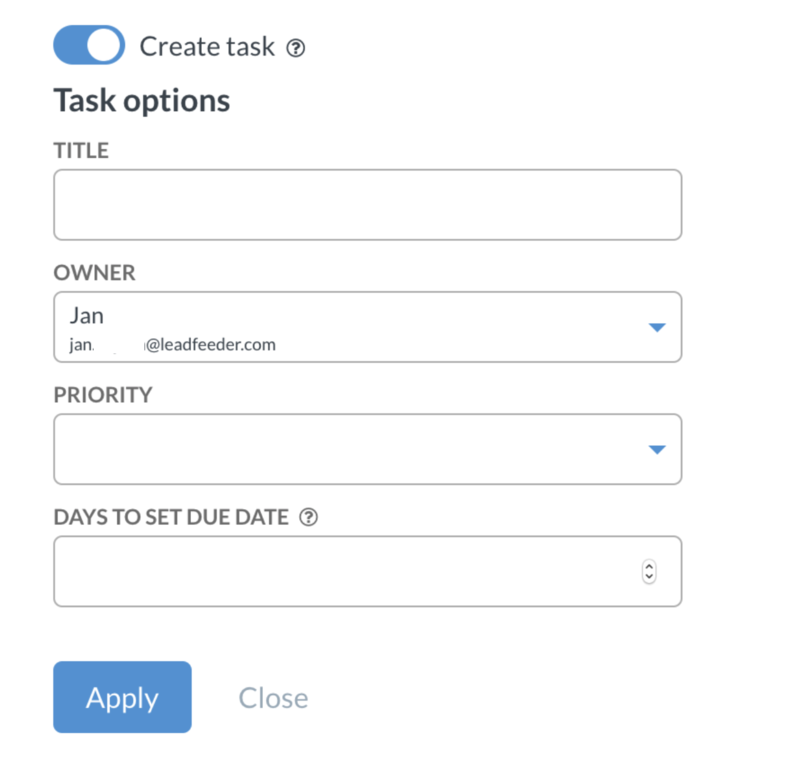 Create a Title and select an Owner, Priority and Days to set due date for the task. Once you are happy with the trigger and the action, click on "Create automation" and Save. You'll see the automation created within the list, appearing as it does below in the following images. You can also manage your workflows from Leadfeeder Settings on the tab Website, under title Automation.